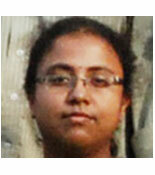 Mrs. Paramita Dey, Asst. Prof., obtained her B.Tech from Kalyani Govt. Engg.College & M.Tech from Institute of Radio Physics & Electronics, Calcutta University. She has been teaching Digital Electronics, Data Communications& Networking, Mobile Communication Image Processing etc. Her current research interest is on VLSI design and development of LDMOS through simulation.